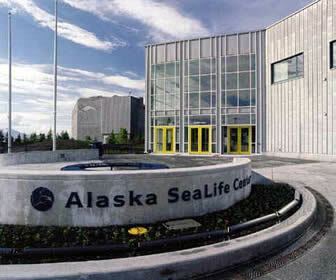 The Alaska SeaLife Center in Seward is one of the only non-profit organizations in the world that has both a public aquarium and fully supported research facility operating in the same building. This combination is important as it allows the public to see an operating research and rehabilitation facility in operation. So what all will you see at the aquarium? Well that changes depending upon current research and or rehibilitation is occuring. What you can expect is to see various marine mammals, sea birds, fish and invertebrates. To be more specific species may including Steller sea lions, eiders, harbor seals, sea otters, fur seals and other species. Public exhibits include a touch tank where visitors can touch small marine organisms such as sea stars and sea urchins in a shallow pool, a grotto for the center's numerous seabirds with a two-story diving pool, as well as harbor seals, Steller's sea lions a Giant Pacific Octopus, and a preserved Giant Squid. There also exhibits of Alaska's most important food fish such as salmon, halibut, king crab, and sablefish. Alaska Resident, AAA, Senior and Military Discounts are available. Visit the Alaska SeaLife Center in Seward AK. and experience the hands-on exhibits, marine live viewing stations and much more. Tours available from your onboard cruise agent.